Below you can view all the homes for sale in the The Greens At Winding Ridge subdivision located in Indianapolis Indiana. Listings in The Greens At Winding Ridge are updated daily from data we receive from the Indianapolis multiple listing service. To learn more about any of these homes or to receive custom notifications when a new property is listed for sale in The Greens At Winding Ridge, give us a call at 317-623-3471. Wonderful opportunity for growing family...this home has always been a model and never lived in. 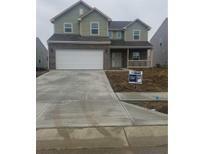 MLS#21623807. Greentree Real Estate Group. – Full porch with Railing on Front Exterior – 9' First Floor Walls – Vaulted Ceilings in the Great Room – Tray Ceilings in the Master Bedroom – Door Between Master Closet & Laundry Room – Upgraded Kitchen with Staggered Twilight Cabinets with Crown Molding – High Definition Laminate Countertops in the Kitchen – Upgraded Deluxe Master Bathroom with Separate Garden Tub & Shower – Additional Lighting and Fans throughout the Home – Upgraded Flooring throughout the Home – Included Black Appliances: Electric Range, Microwave & Dishwasher – Enlarged Rear Concrete Patio MLS#21618067. Ridgeline Realty, LLC.